Can you link this to your transcript thing, so a beta tester can send a transcript to the author? Testers can add comments to a transcript by typing something * before a command by the way. >Can you link this to your transcript thing, so a beta tester can send a transcript to the author? I was thinking of making the error script automatically add its output to the log, then adding the text from the log to the body of the message. The transcript would be much better, though! Hrmm... I'll have to see if there's a way to add a file attachment in the URL. If it's possible, I shall post new code here. >Testers can add comments to a transcript by typing * before a command by the way. I can't find a way to include an attachment, and the character limit for the URL is 2083. If I had a server, I could make it upload the transcript to said server, then include that URL in the body of the email, but I have no server. can you use a public file sharing service? or even a google drive? 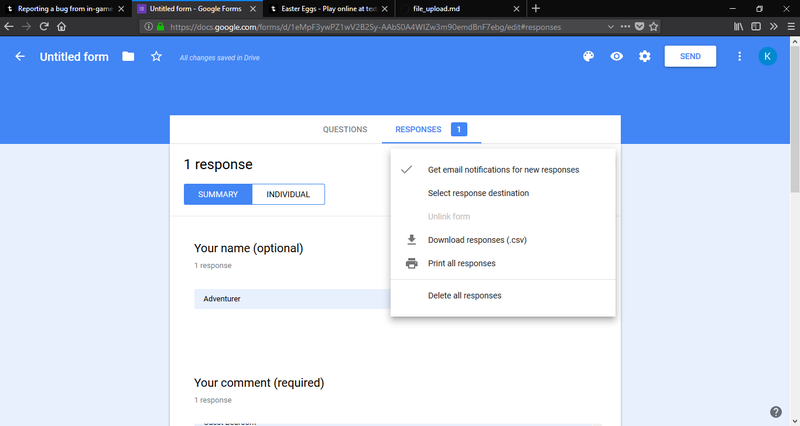 You might be able to open an iframe with Google Forms, and post from there. Not sure, but I think the Forms system checks to prevent you posting directly from a form on an external site. I've got enough spare bandwidth to set up something on my webserver (maybe even allow it to post to a bugtracker wiki; the mediawiki API is pretty straightforward); but that's best left until after server migration, if I can ever find time to set it up. I think any web app designed for tracking software bugs (are there decent free ones?) is likely to have an API so that an app can submit reports to them. I know nothing about file-sharing. Using Google Drive or a Gist would assume the player had an account. I went to check out some free file-sharing sites, and the first one popped up a warning that I had viruses! Summation: I don't think I like free file-sharing sites. My current method is posting my rough draft here, then posting the final version in "Libraries and Code Samples". The thing that makes me worry about this is the fact that I never use a few features (like the map or room pictures). That's why I was thinking about Google Forms; you can make a spreadsheet on Google Drive that people can add rows to by filling in a form. Can be set to one submission per person, or free submission. Not sure how hard it would be to fill in a form using JS, or even to use $.ajax() to submit data to the backend directly. Might need experimentation. Good point. I'll put these in Libraries and Code Samples from now on. Online, I've never been able to do jack squat with anything that didn't have a URL starting with "play2", even just loading it into an iframe. ...but there are many things of which I am unaware. I'm left Dagobah before my training was complete. Anyways, I'm trying out suggestions. Just been playing around with Google Apps Script. In a spreadsheet on google sheets, you can go to Tools -> Script Editor. If you create a doPost(request) function, then within Quest's JS you can use $.post("(your google sheets URL)/exec", somestring); to call it. Within the sheet's doPost function, you can get at that string using request.postData.contents, and split up the data to insert into your spreadsheet. ... but I have sent the link to your writings to a few fellow-readers. I ended up getting a spreadsheet set up on Google Docs, but I got cross-domain errors whenever I tried to interact with the spreadsheet from outside of its page. The option to select and copy the text to the clipboard does not currently work online, so it won't even ask unless playing in the desktop version.